We automatically assume that more choice is better although we know that this is not the case in restaurants with extensive menu choices. The same paradox applies in dating apps: the more choice we have in dating, the harder it is to make a choice (my 2018 blog). A 2004 book by American psychologist Barry Schwartz calls this phenomenon the Paradox of Choice. With the knowledge of hindsight this paradox of choice also featured in my 2017 "greenfield" blog. Selling my house is the only thing I know for sure. Unfortunately, this opens a ton of choices: Africa, Asia, Americas, Australia, and obviously good old Europe (eg, Italy, Portugal). I am limiting my choices by using constraints, like avoiding high and low temperatures. 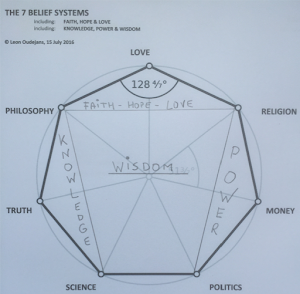 My diagram is governed by the 4 elements that are often mentioned in the paradox of choice: anxiety, information, time, utility. Information and Time are input factors. Added value / Utility and Anxiety are output factors. There are 2 fundamental constraints: budget (eg, money) and focus. It's not possible to stay focussed 24/7 nor have unlimited budget. Obviously, minimising the input factors Information and Time will almost never give a good choice. 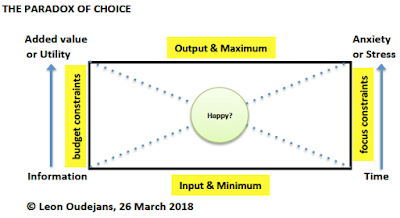 The paradox of choice implies that the same is true for wanting to maximise the input factors. This would show many similar dots as a best choice on your personal utility curve. Seeing this will create anxiety or stress as there is still no (best) choice despite all efforts. Initially, the text in the circle of my diagram was "best choice". Then I remembered a NYT article claiming that the key issue is whether you are happy with your choice. A best choice may not make you happy. 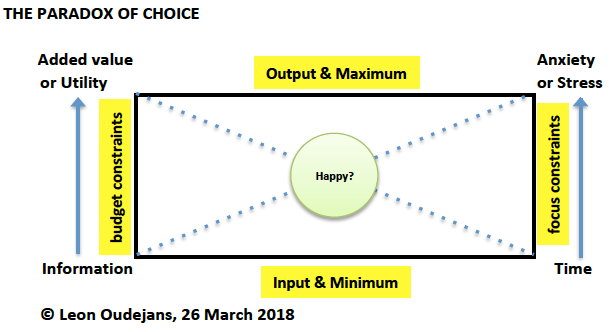 However, a happy choice is always a good - perhaps even your best - choice. Despite all efforts, my personal paradox of choice appears to be: Home Sweet Home.